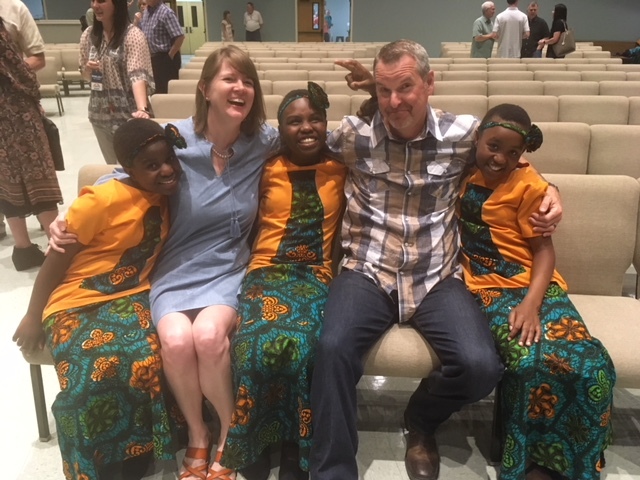 Even before Lynn Wilson’s text buzzed my phone asking for host homes for the Daraja Children’s Choir, the Lord had already placed the desire in my heart to open my home. I had heard their concert last year, and knew if they ever came again I wanted to serve as a host home. I immediately shot a text back to Lynn, “Ooo, Ooo, pick me! Pick me!” before anyone else got them first. As the days got closer to their arrival, my family went into cleaning overdrive and boy did the upstairs need it. Several trash bags and “give away” bags later, we were both ready for our guests and acutely aware of how much stuff we really do have. I wanted these girls from Uganda to feel like princesses in my home. Friday afternoon I brought three 11-12 year old girls, Trinah, Imaculate, and Rose, and their chaperone, Sam to my house. The girls were incredibly well behaved and upon spotting our Amazon “Alexa” asked Sam for permission to talk to “her”. They apparently had been exposed to Amazon Alexa at a previous host home and knew just what to do. In the most charming accents they asked her to play the “Church Clap” while singing and dancing along to the music. Alexa already seems like magic to me, so I can’t imagine what it’s like to little girls from Africa! Visiting with them all weekend was delightful as we asked questions about the cultural differences. Imaculate informed me that, “On your happy birthday in Africa, instead of receiving cake and gifts, friends sneak up and pour buckets of water over your head several times that day.” I told her we only do that to coaches if their team wins a big game. The Daraja tour schedule includes a devotional time each evening in the host homes. What a blessing it was to be included as these precious children shared their favorite scripture and what it means to them. Daraja is training the next generation of leaders by allowing the students to practice leading devotions and praying out loud for others. I was convicted that my family and the American church as a whole should be more devoted to practicing devotions in the home and training the next generation for ministry. The highlight of our weekend was the concert Sunday night. Dressed in traditional costumes, the whole choir radiated the Holy Spirit through their smiles, songs, and uninhibited worship. At one point the children came out into the audience and knelt to pray aloud for various people throughout the congregation. The presence of the Lord was palpable and powerful that evening. I think we got a glimpse of what heaven will be like as people from every tribe, tongue, and nation will worship our Lord together. My takeaway from the weekend is that we really do worship the One True God who binds our hearts together with the Holy Spirit. The genuine love and hugs from these girls connected us forever. It’s amazing to me that God allowed these girls from the other side of the world to come and stay at MY house! How else would I ever get the opportunity to know and serve them? I may never see them again in this lifetime, but I know I will see them throughout all eternity and we will once again visit, laugh, and worship together. I encourage you to leap at the opportunity to host if Daraja Children’s Choir ever returns to our area. Paul reminds us in Romans 12:13, “When God’s people are in need, be ready to help them. Always be eager to practice hospitality.” Cleaning up my house and preparing meals took effort, but the blessing far outweighed the cost.